March 8, 2011 March 9, 2011 Dan O. Your head will probably hurt by the end of this one. A troubled teenager (Jake Gyllenhaal) is plagued by visions of a large bunny rabbit that manipulates him to commit a series of crimes, after narrowly escaping a bizarre accident. 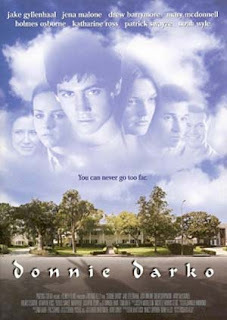 Donnie Darko is one of those cult films that is “the crazy film” that all the hip, cool teenagers all talk about. Some say it’s amazing, some say it makes no sense, and as for me I’m sort of in between which is all good. Writer/Director Richard Kelly is amazing here in his debut flick with a lot of things to do, but makes it all so perfectly laid out for us to easily follow. There are a lot of perfect scenes where it’s just a cheesy 80’s song played over all this movement around one area, and it really is perfect how he captures how humans inter-act. My favorite scenes are the ones he uses with the school, because he captures all of the cliches of your typical high-school, but makes them look so real. He also has a lot of mind-bending scenes where he does a play-back, speed-up, and some cool special effects that all look great and add a lot to the overall feeling of this film. My favorite element of this film probably has to be the amazing script this has. It touches on so many subjects with such wit, bravery, poignancy that it all works here. There is a lot of confusing things that happens, but to back it all up you have these pitch-perfect conversations that these characters have that almost feel like real-life. There is plenty of talk about how the 80’s American dream was viewed as, and how the suburban family really was, and the way Kelly satirizes it, just works so well. Despite all the normal, every day talk that this film brings up, there are also questions about life that make you think. Is the life we live, exactly how we imagine it? And if so, can we change our out-comes or are we all just destined for our fate with no way of changing it at all? These as well as many other questions are brought up and we never quite figure out what exactly this film is talking about sometimes, but it’s almost too hard not to be confused. However, I think that Kelly’s best part with this film was the human parts of this film. I loved the scenes where Donnie is sitting at dinner with his family, or is in school, or just talking to his friends. All of those scenes were perfect of how they captured human emotions, and reactions, but I almost wish there was more of that. The film tends to lose it’s head in all the craziness that ensues so a lot of the poignant and honest human parts are lost. Jake Gyllenhaal is the perfect choice for social out-cast Donnie Darko. Donnie is one of those kids in school that didn’t really talk to anybody because he didn’t care, was a little strange, and didn’t want to be a conformist, and Gyllenhaal plays that part so well. He’s such a smart kid that almost everything he says is like poetry, and the teenage angst he has is just so perfectly played. 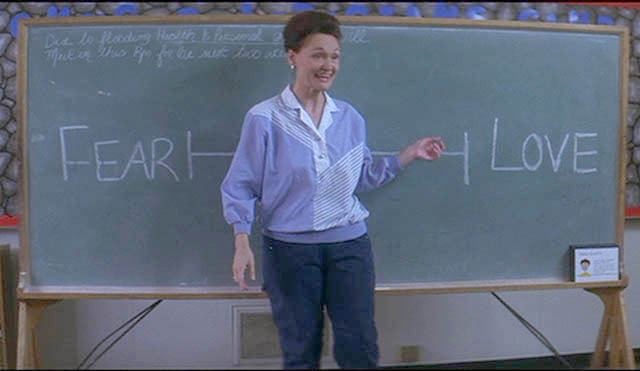 Donnie Darko may be one of the best teenage character’s of all-time, and one of Gyllenhaal’s best performances of all-time. The rest of the cast is pretty good too each getting their own screen-time. Jena Malone is great here as the main love interest, Gretchen. Her character is so sweet, and cute that the scenes that her and Donnie have are my favorite. 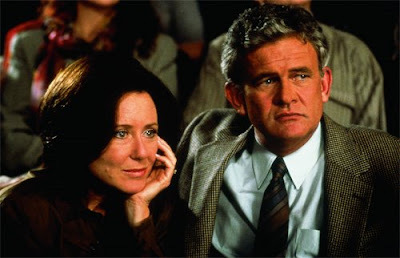 Mary McDonnell, Holmes Osborne, and Maggie Gyllenhaal, which in case you couldn’t tell is Jake’s real-life sister, they all play members of the Darko family and do a great job as well. Others in the cast that do good jobs as well are Drew Barrymore, Noah Wyle, a really young Seth Rogen, Beth Grant, and the always reliable Patrick Swayze doing everything right. Also, may I add that the ending is epic. The film perfectly builds up to the last 15 minutes, and you won’t forget about it when it’s over. Consensus: Writer/Director Richard’s Kelly debut feature may lose it’s head with the mind-bending elements, but it has a perfect script, great performances, and a story that goes places you won’t be expecting, and won’t be disappointed in seeing anyway. I’ve got to get around to seeing this movie! I’ve actually posted the big song that came out of it twice, most recently in Mad World. Strangely, it was only through comments by readers that I even heard of this movie. It was a very cult followed movie. Cool stuff! I recently saw the Director’s Cut (came free with the Sunday paper). An excellent movie, completely agree with you! Great review. I have the original, theatrical cut on DVD but I don’t have the Director’s Cut. I do enjoy the film. It’s in my list of the Best Film of the 2000s (which is a project I’m doing kind of sporadically). Plus, I’m a sucker for anything great with Maggie Gyllenhaal and Jena Malone (two of my many crushes). This is great, and I can’t wait to see that project my man! This is a gut-punch of a film, and you’ve nailed it perfectly Dan! Great review! Thanks Man! This really was an awesome film! Whatever happened to Jena Malone, anyway. She seems to have disappeared off the face of the planet! It’s really a classic, it’s in my list of movies I gave a 10. It’s one of those films you keep thinking about days after you’ve seen it. What has kept you from giving it a 10? I was thinking about this long after it was over actually. I really thought I was gonna fall out of love with the movie, since I haven’t seen it since high school. Saw parts of it again and it still has that spark. It does have many of its moments. Yeah, I haven’t seen the film in many years either, and was thinking I might not like it as much as my initial viewing. This review, a nice one at that, has me thinking I should give the film another look. Good then my mans, give it another look. Well, I do really like this film. Thanks man!